SYNTHESIS: (from indole) To a well stirred solution of 10 g of indole in 100 mL MTBE, cooled to 0 °C with an ice bath, there was added 8.6 g oxalyl chloride. The reaction mixture was stirred for 0.5 hr, and the solids removed by filtration and washed twice with 50 mL MTBE. This acid chloride was added to 20 mL anhydrous diisopropylamine. There was then added an excess of 2N HCl, the mixture cooled, and the resulting solids removed by filtration. These were recrystallized from MeOH to give, after air drying, 11.4 g (49%) indol-3-yl N,N-diisopropylglyoxylamide with a mp of 200-202 °C. A solution of 11 g indol-3-yl N,N-diisopropylglyoxylamide in 350 mL anhydrous dioxane was added, slowly, to 19 g LAH in 350 mL dioxane, which was well stirred and held at reflux temperature under an inert atmosphere. After the addition was complete, reflux was maintained for an additional 16 h, the reaction mixture cooled, and the excess hydride destroyed by the cautious addition of wet dioxane. The formed solids were removed by filtration, washed with hot dioxane, the filtrate and washings combined, dried over anhydrous MgSO4, and the solvent removed under vacuum. The residue was dissolved in anhydrous Et2O and saturated with anhydrous hydrogen chloride. There were formed crystals which were recrystallized from benzene/methanol to give 4.5 g (40%) of N,N-diisopropyltryptamine hydrochloride (DIPT) with a mp of 198-199 °C. (from tryptamine) A solution of 1.60 g tryptamine base in 10 g melted sulfolane was treated with 8.5 g isopropyl iodide and 6.5 g diisopropylethyl amine, and held at steam bath temperature for 12 h with occasional shaking to mix the two phases. This mixture was then added to 100 mL H2O, and extracted with three 30 mL portions of hexane. These were combined and, after removal of the solvent under vacuum, the residue was distilled at the KugelRohr to give an off-white oil boiling at 170-185 °C at 0.05 mm/Hg weighing 1.37 g (56%) that spontaneously crystallized to a solid, mp 69-71 °C. Recrystallization of a sample from hexane produced a white product with a mp of 72-74 °C. IR (in cm-1): 742, 791, 1009, 1133, 1162, 1198. MS (in m/z): C7H16N+ 114 (100%); C4H10N+ 72 (38%); indolemethylene+ 130 (18%); parent ion 244 (<1%). A solution of 0.50 g of the free base in 2.5 mL isopropanol was treated with 0.5 mL concentrated HCl and slowly diluted with Et2O with good stirring. There was thus obtained, after filtering, washing and air drying, the hydrochloride salt with a mp of 192-193 °C. The infra-red spectrum of this salt was the same from either source; IR (in cm-1): 752, 773, 935, 972, 1138, 1183. QUALITATIVE COMMENTS : (with 18 mg, orally) "Wild effects noted in an hour. Remarkable changes in sounds heard. My wife's voice is basso, as if she had a cold -- my ears with slight pressure as if my tubes were clogged but they aren't. Radio voices are all low, music out of key. Piano sounds like a bar-room disaster. The telephone ringing sounds partly underwater. In a couple more hours, music pretty much normal again." (with 25 mg, orally) "Within the first hour I noted changes already, and my hand-writing became very poor. I cannot seem to measure the rate of the drug's effects as there is no obvious window through which I am moving. Abrupt sounds have golden spikes attached to them as after-sounds, but I can't focus in on any other sensory changes. I moved into a completely quiet environment and there don't appear to be any effects of any kind. If I were deaf, this would have been an inactive compound. How many other drugs have appeared to be inactive because I didn't know where to look for effects?" (with 50 mg, orally) "Everything was auditory, and I can only describe it with a '!'" (with 100 mg, orally) "Nothing until 35 minutes when a definite change in hearing was observed. There was a decrease in high frequency acuity with an unusual tonal shift of all frequencies to a lower pitch. Voices sounded very similar to a single side-band radio signal which had been mistuned to the low side of the center frequency. All familiar sounds became foreign, including the chewing of food. No effects were noted with respect to clarity of speech, and both comprehension and interpretation were normal. Music was rendered completely disharmonious although single tones sounded normal. There were no changes in vision, taste, smell, appetite, vital signs, or motor coordination. The effects began to fade at four hours post ingestion, and were completely gone at eight hours. Mild diarrhea occurred from five to ten hours post-ingestion but was not a significant problem." (with 250 mg, orally) "Shortly after I ingested the substance I heard a spirit say, 'Once in a lifetime.' She encouraged me to believe that I would have more life after the experience. But, there was a feeling of foreboding. The light was there, but DIPT was the body of Satan. The voices of people were extremely distorted -- males sounded like frogs -- children sounded like they were talking through synthesizers to imitate outer space people in science fiction movies. In fact I felt that I was somehow sent into an anti-universe where everything looked the same as normal but was a cold and empty imitation. I felt I was a fallen angel." (with 8 mg, smoked) "In four minutes I was aware of things going on, and by eight minutes, I was at a plus 2. My tongue was numb, and my ears felt plugged up although my hearing was keen and there was a background hissing sound." EXTENSIONS AND COMMENTARY: Most psychedelic drugs affect, primarily, the visual sense, but here is one that shows its effects primarily in the auditory system. And it screws it up in a most unlinear manner, in that there in not just a simple decrease in pitch which would be as if someone had his thumb against the LP record and made everything come out at a 3/4 speed text, or a 1/2 speed text. Actual roportionality is lost, so there is complete harmonic distortion. A physician friend of mine has expressed it using a neurological vocabulary: "If it [the drug] delayed only the neural response to a stimulus, then pitch might have been shifted down, and yet harmony between notes should have been preserved. A variable delay related to the pitch of the stimulus would produce the disharmony but would not explain the preservation of normal relationship between single tones. It seems clear that this compound affects the auditory processing centers in the brain in a complex way which deserves further scientific study. The lack of significant toxic effects should make this compound useful for further studies." I am in absolute agreement. Here is a drug that goes directly after the hearing system, rather than the seeing system. Let's stick a carbon 11 on one of those isopropyl groups, and see where the drug goes using the positron emission tomography camera. Will we highlight the auditory cortex? Or maybe some association area? But if we are indeed dealing only with musical pitch, not musical structure, there might be only a small part of that cortical region visible. This could well be a tool for two things. First, the localization of the pitch center in the brain. And second, it is a prototypic drug that might allow structural modification in several directions with several augmenting atoms. Some simple homologue might well have even more remarkable and specific properties. If you don't look, you won't find. I have been told by an adventurous graduate student that a study has been made with two subjects who had absolute pitch, employing a piano and a sine-wave generator as a sound source. He wanted to explore the possibility that some relationship could be developed between the pitch of the note provided and the apparent pitch of the note perceived. No meaningful relationship was found, except for the reinforcement that the observed drop in pitch was not linear, in that true distortion rather than simple pitch dropping was always observed. Most interesting was the plot of the error for each note against the elapsed time. This provided what could be seen as an almost-quantitative measurement of the drug's intensity and chronology. 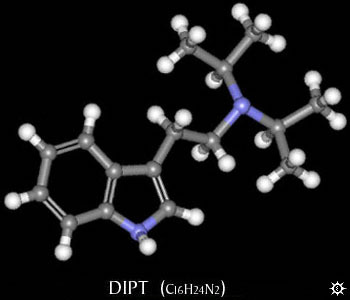 Pretreatment with relatively small amounts of MDMA (35 milligrams, at between 1.5 and 2.5 hours before DIPT, at 55 milligrams) led to an exaggerated distortion, with an enhanced intensity that verged on being painful. The homologue with only one isopropyl group on the nitrogen, N-isopropyltryptamine or IPT, has been made according to the same recipe, with the indol-3-yl N-isopropylglyoxalylamide (mp 199-200 °C from methanol) obtained in a 98% yield, and the amine hydrochloride (mp 245-246 °C from benzene/methanol) obtained in a 60% yield. The free base distilled at 130-140 °C at 0.1 mm/Hg to give a fraction that spontaneously crystallized to a very hard solid. MS (in m/z): C4H10N+ 72 (100%); indolemethylene+ 131 (60%), 130 (32%); parent ion 202 (3%). No active level has yet been found in man, to my knowledge.